Corporate event planning doesn’t need to be daunting. Newcomers to the event space can start with the basics, like checklists for everything you’ll need to cover. Follow these guidelines to put everything under control before the company party. You can also take pointers from the City of Toronto’s event-planning guide right here. Checklists underpin successful execution of every process, and event planning is no exception. You need a repeatable process to follow to make sure that no detail slips through the cracks. The reason for this is simple: small details on the technical side can trip up an entire event. People tend to notice things that are missing or out of place just as often (or perhaps more often) than when everything fits together nicely. Make lists even if you don’t need every item on those lists—it’s much better to have too much than not enough. Get checklists for everything from experts in the know, or ask them for introductions to people who can provide them. Someone will be able to give you a checklist to get started. Professionals may not want to give you a checklist for free, but you can get detailed estimates from them with itemized breakdowns for any proposal. Ask for one if you encounter resistance to get an idea of how much everything will cost. You can’t plan an entire event by yourself, especially in cities as busy as Toronto. You might not have the budget or company size to warrant a separate point person for each set of responsibilities, and that’s okay. Divide them up evenly among the people who can lend a hand and ask for regular updates from them every few days. Contact Us and ask for your Toronto Venue List! With everyone on board to plan the event, you can move into the bread and butter of the planning stages. This starts with the budget. Your budget will define the scope of the entire event, but don’t fall into the trap of spending it all. You’ll need to leave some in reserve to handle unexpected hiccups of all kinds. If you have a budget of $15,000 to spend on your corporate event, then you should aim to leave $2,500 to $3,000 in reserve. 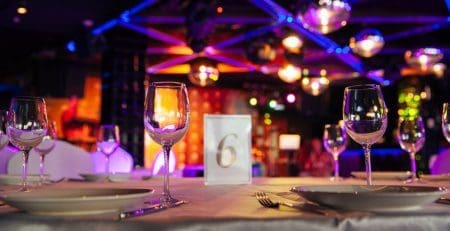 People could forget something like cutlery, sound equipment, coat racks, or even just indoor decorations for the venue. These things can pop up at any time, so give yourself some financial breathing room to adapt. Live Music: $4,000 or more for the evening. Audio Visual: talk to us for a detailed estimate. Event Venues: $110 per person. Don’t forget to compare notes between different vendors, too! We’ve provided pages just above that list various venues, caterers, and entertainment groups in the Toronto area. You’ll find the best prices by comparing packages from different sources. Be sure to decide if you need to purchase or rent equipment instead of paying vendors to supply them. Venues can supply certain items, but it might make sense to purchase others if your corporate event will continue for years down the road. Venues go quickly, so book them well in advance—especially if you want government funding. You might need to shift your day schedule in order to call venue owners at the right time of day and tour the facilities. Start your search with this list of 30 venues in the city. Toronto is a big city with plenty of resources and options to plan a corporate event, if you know where to look. Talk to us at Straight Street Event Services to turn yours into the talk of the town with stunning lighting, sound, and visuals.